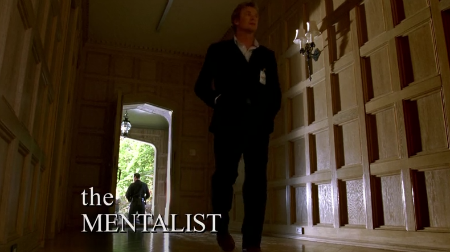 We have introduced you to English TV Series Mentalist in this introductory article about the same. And we promised that we will keep updating you with our views and reviews for the same episode wise. So let us begin our journey with the first episode Pilot. As expected this episode is meant to provide basic background information about various characters and introduce them. Of course, their attributes will be explored gradually as the tale progress. To the credit of scriptwriter, the episode is on right track since the beginning. Rather than spending time in introducing characters and their attributes (which the episode is intended to), it directly lands into main story. Where we gradually know them. The camera moving on “Missing” posters of “Mercy Tolliver” while showing us a crime scene speaks a lot even without the dialogs. Tereca Lisbon, the officer incharge from CBI (California Bureau of Investigation) along with Patrick Jane (an Independent Consultant to CBI) approaches the crime scene. We got to know about the case via the police officer’s briefing to them and through the speech of the missing girl (who found murdered)’s parents. My name is Patrcik Jane and I am here to help you. Would you like a cup of tea? Yes, I would, thank you. Now you cannot expect such smooth and calm communication while watching Elementary or Sherlock (or other similar serial for example). The conversation moves ahead and explores more characteristics of Patrick Jane. He is able to tell the lady a lot about her. And when asked whether he is a psychic, he talks about himself a little. The scene is written and filmed nicely and it is delightful to see how he is able to compose the lady in the tough times. Actually, the family of the victim need emotional support more than anything. And he does so. The writers deserve the credit for the same. Also, pay attention to the body language of the lady when she was asked that “why she suspects her husband?”. It gives you a lot of things to look at. Of course, her nervous behaviour tells us she actually does suspect her husband. In addition, it introduces us the habit of Patrick to ask direct questions. Sometimes it looks obvious, sometimes it is considered as misbehaviour, but in most of the cases they are able to get true answers as the response! Here we are introduced to the world of psychology without realising. And, after seeing Patrick asking her husband the question that “whether he killed her daughter?”, we are informed that we will be seeing such direct questions in coming episodes regularly (and yes we do). Simon Backer slips into the character of Patrick Jane so smoothly and nicely that often you found it very natural for him. He completely looks the character. The charming and innocent yet effective. A person who hates fighting, runs away from guns and firing. Don’t like to be punched in any case. Completely opposite to him is Teresa Lisbon, played by Robbin Tunney. Sometimes her skinny frame makes her looking less convincing as the boss. But her acting pays off. We had seen her acting abilities in Vertical limit movie. Here she is going-by-the-book officer. She, however, remain as a rock-solid support to her team. Her character is written nicely too. Though we start seeing more about her in the second half (of this episode). But, this is how we are introduced to the characters. Actually, the main content starts after this scene and it is interesting too. It is a case of a golfer whose wife an brother are murdered and the scene suggests that it is done by Red John! The makers introduce us to Red John (whom we don’t see in the entire season). Red John is a serial killer who lives his signature after each crime. The latest crime scene has his signature too! So he is active again!? And there is a relation between Patrick and Red John! Of course, the relation of hate. Why? We are told about the same in the last segment of the episode. Also, the entire team of agents work under the command of Lisbon (and her signature way to answer the phone) is introduced to us as well. The character of the homicide detective is interesting too. Just focus on his actions throughout the episode. The camera work is smooth and it is focused (if it wasn’t the things could have gone terribly wrong for the TV show). It explores the locales where needed. Some natural beauty of Palm Springs, CA is explored where possible. But main work is exploring the details at crime scenes. The crew who arranged the details and helped to make the sets look authentic deserves applause too. The smartly written dialogs explore the characters authentically. You need to study human behaviour thoroughly while making a crime thriller (and especially the detective fiction, where the protagonist is good analyser of human behaviour). The research work done for the same is clearly visible on the screen. Patrick: Be reasonable. This is my case. Patrick: Red John is mine. Lisbon: Red John doesn’t belong to anyone. Patrick: He belongs to me. Bruno’s genuine efforts in making this TV Show pays off.